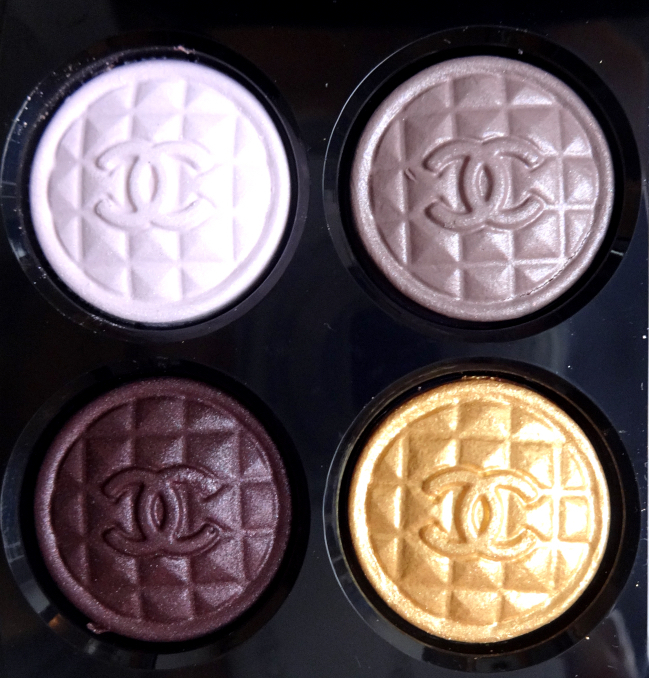 Like many Chanel collections, "Collection Vamp Attitude" excels in color composition if their formulation is questionable to some. 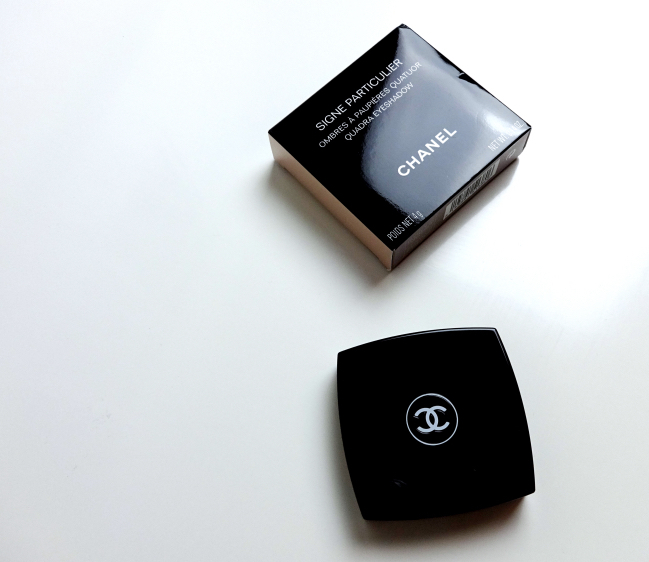 (I happen to like the Chanel eyeshadow formula.) I love that the typical holiday elements like gold and red are all there yet it's dark and mysterious. 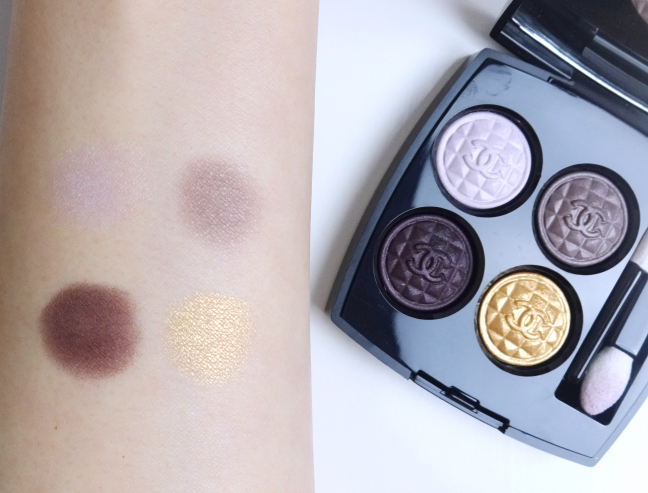 Chanel Signe Particulier is basically a purple smoky quad with a gold accent. Chanel speaks of "exquisite versatility", and I think they might be on point (I enjoyed watching these videos for two very different eye looks using Signe Particulier; I was impressed to see the model actually seems to know how to put on makeup). Then, I lotioned my arm to show better color intensity. 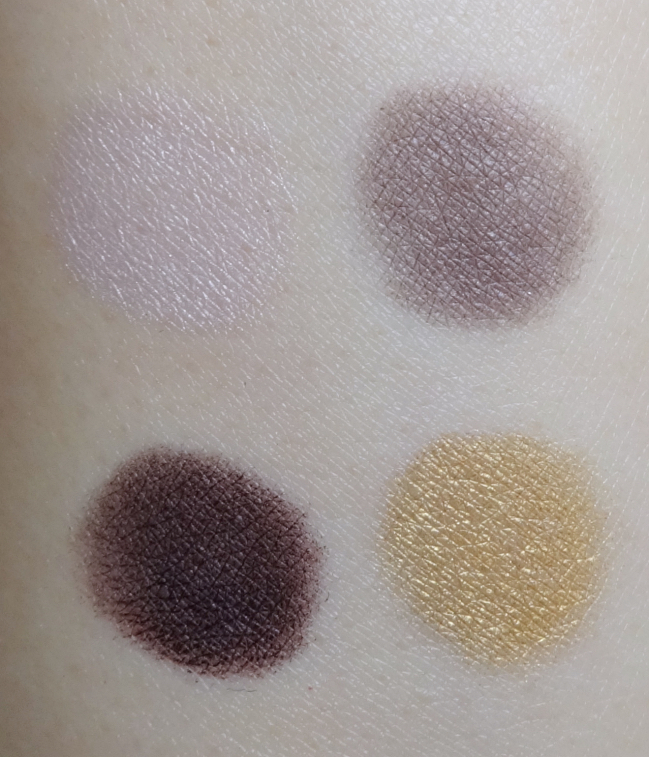 Every shade is fairly well-pigmented and seems to blend well. I love the color composition of this quad more than anything. Dusty purple is my all-time favorite anyway, but the whole thing just becomes a bit more special with great highlighting and accent shades tucked in together. I still need to figure out the best way to wear Signe Particulier, but I know I am going to have a lot of fun with this unique, wearable quad. A few look posts are in order. Wish everyone a great weekend. I love the top row of swatches! Look posts are totally in order, because I can't imagine how to tie the gold into the look. Such a stunning quad, I can't wait to get mine. Your swatches are so on point, makes me more excited! Haha, it's resuscitated for now! These days my appetite for beauty products is quite tame although I still find myself wanting a few things. It's just that I don't feel the urge (or the rush after). I guess it's all good since many of us are trying to find some balance in this. For me, though, I've never felt a big remorse so that I wanted to reform myself in the subject. Great pick, Lena! I think Chanel did well with its Holiday collection. If there was a Chanel counter near me, I might have just caved and broke my 2-month streak of no buy! I agree! 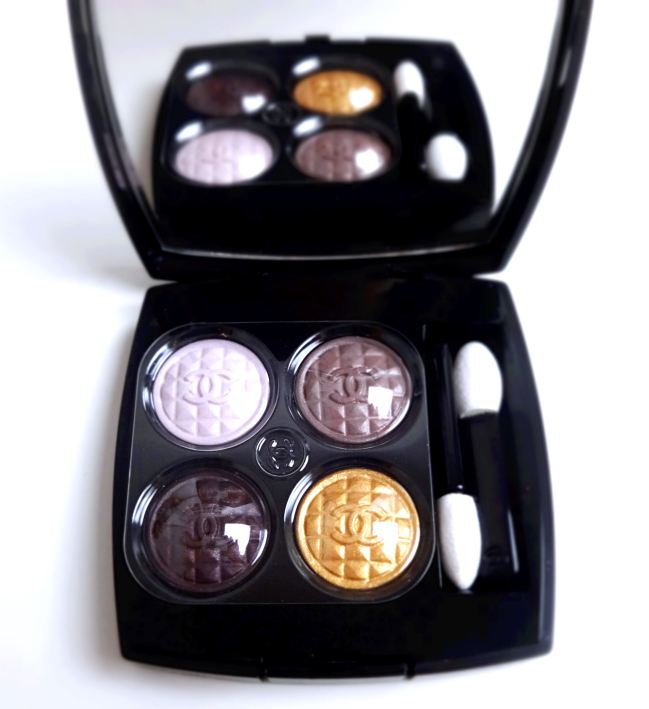 Besides the Snow Ballz from Guerlain, I like the Chanel holiday collection the best. I bought one Chanel quad as a birthday grift for my best friend last year and wanted to pick one up for myself but found most are shimmer without any mattes so I skipped. However, I really love this quad here! You're right, the colour combo is stunning and I look forward to see all the different looks that you'll come up with this quad, Lena! Pretty! I've seen in on display and it really does scream holiday! I would have preferred if the deepest shade was a touch more reddish or cranberry but otherwise it looks fabulous! I'm always coveting and lusting after make up items! UGH I wish I could stop for a bit but it's almost impossible! Yes! And it is still dark and gloomy in a very glamorous way, which is why I love the collection. I don't intend to drop my money on the burgundy mascara or the glitter top coat, but the eyeshadows and the blush really stand out to me. That light pink is so pretty! Can hardly wait to see some looks you create! I haven't tried the gold and the burgundy together, but you just gave me an idea! 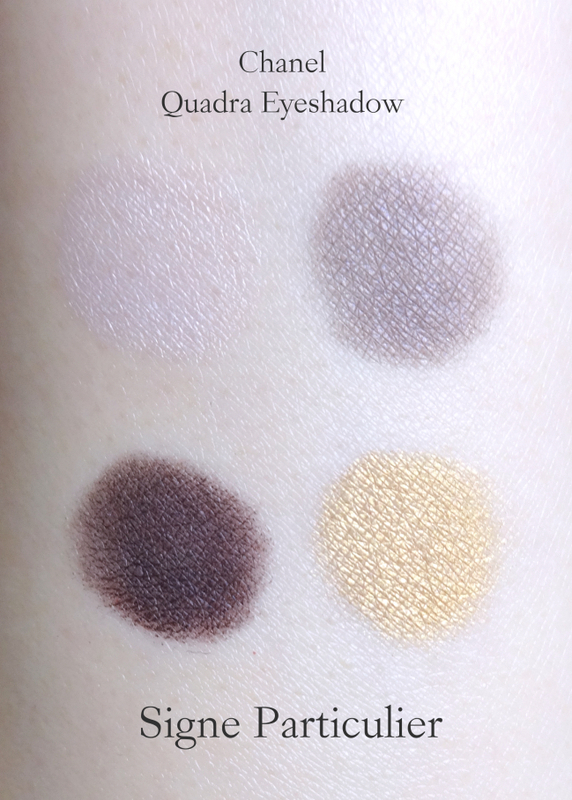 I wonder if chanel shadow can do the gradation thing (then have the gold as accent?). Suqqu ginbudou has a similar composition as this (plum+gold+gray/taupe+white)and it was actually quite wearable. I imagine if its western brand it would be way too heavy for me to handle. Can't wait to see your looks with this! Ugh, I'm trying to figure out how to comment on Blogger now without using the Reductionista handle. I don't like having blank images beside my name, lol. Anyway! Been admiring pictures of this on IG but haven't seen it in person. Bet you wear it well! Many seem to think this quad to "too sheer". And interestingly enough, I haven't been able to pin down the best way to wear this quad incorporating all 4 colours, yet. This is so freaking pretty! What a gorgeous collection of colors. Can't wait to see what you come up with in your playtime with this beauty! I've been reaching for the quad almost everyday lately! It is really versatile for sure.